"Make a Gambian Child Smile." The Gambia is one of the poorest nations in Africa, ranking in many lists as one of the 10 poorest nations in the world. Agricultural problems such as low and decreasing soil fertility, lack of access to quality seed, and irregular rains that frequently cause crop loss are just a few of the circumstantial problems at the base of The Gambia’s failing economy leading to poverty for more than 75% of the population. Karmic Angels UK in conjunction with sister charity Karmic Angels in The Gambia, aims to establish and support projects providing relief, aid adding to the development of the people of The Gambia. SevaVision Inc will send a documentary crew, artists Rising Appalachia and Maria Broom, into The Gambia to bring an additional voice to the people there. Our purpose is to raise funds for production and travel, as well as, a minimum of 15K to further support the Karmic Angels projects. We will explore and discover the life and truth the people of The Gambia sing. 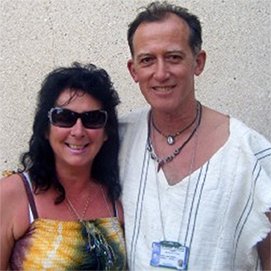 Karmic Angels, an NGO charity organization, will take us on a 14 day tour through The Gambia. This tour will take place during the 50th Independence Day Celebrations of The Gambia and, is in large part, a reason for our attendance. During our stay, The Karmic Angels will show us the work they’ve been doing, as well as, the seemingly insurmountable work that needs to be done. While working with rural communities to overcome poverty and suffering, they remain committed to a long-term goal of sustainability and future self-sufficiency for The Gambian people. It is our plan to capture the spirit and life of The Gambian people through the stories and experiences we encounter. Bringing along the environmentally and spiritually conscious band Rising Appalachia, as well as storyteller, actress and performer Maria Broom, we will integrate music and story into a film that seeks to discover, not show and tell. The beauty of nature and humanity speak for themselves. By using the purely unique medium of film to capture this life, the spirit of The Gambian people and the country, will teach us something purely unique and most definitely unexpected. While working with rural communities to overcome poverty and suffering, they remain committed to a long-term goal of sustainability and future self-sufficiency for the Gambian people. Proin eu ligula at urna pretium hendrerit et ac nunc. Sed vehicula, enim sit amet cursus egestas, massa dui elementum mauris, sit amet luctus felis dolor ut nunc. Sed gravida dui nunc, vel pellentesque leo adipiscing dictum. Making a difference in The Gambia: matching resources and need by working with rural communities in The Gambia to overcome poverty and suffering. The long term goal is to safeguard the future self sufficiency and sustainability of the localities in which they work. 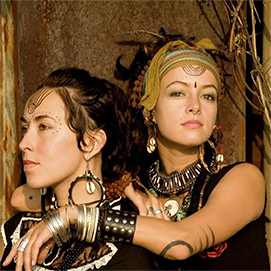 Rising Appalachia brings to the world new sounds, stories, and songs collected across oceans and originally sculpted to embody our human journey, our global community and the treasures and troves of soul harmony. 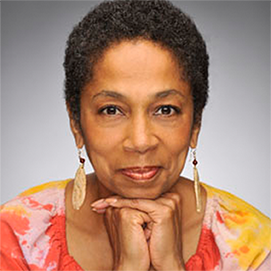 Although nationally known as an actress for her recurring roles in HBO’s “The Wire” and “The Corner”, Maria is also a storyteller and dancer with more than forty years of performing and teaching in the US and across the globe. 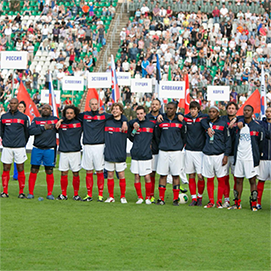 UK 3 Lions support charities and organizations at home and abroad using their celebrity affiliations to raise money and awareness, and promote social investment, through charity football games and music concerts, also helping communities raise and address social issues and threats, through youth and community programs. Aher fame on the BBC's The Voice, X Factor and post international and Premiership football careers, they came together to host funds and awareness raising events and programs around the world. Help us to make a Gambian child smile.